My old and tattered volumes - in urgent need of being replaced! From when I was about eleven I was fascinated by Sherlock Holmes stories. Back in the GDR the books were not easy to come by so I spent a lot of time visiting the few used book shops in my town quite frequently in order not to miss the occasional copy. 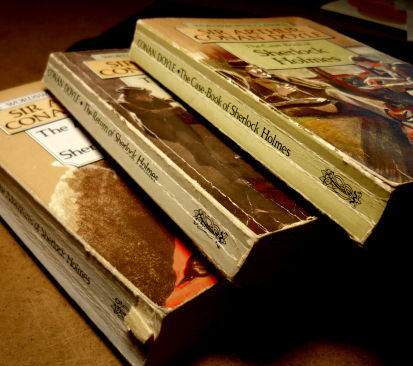 I must have just turned fifteen when I got my hands on a three volume Wordsworth Classics edition of Sherlock Holmes stories. The battered look of the volumes testifies to my having read them many a time since then.